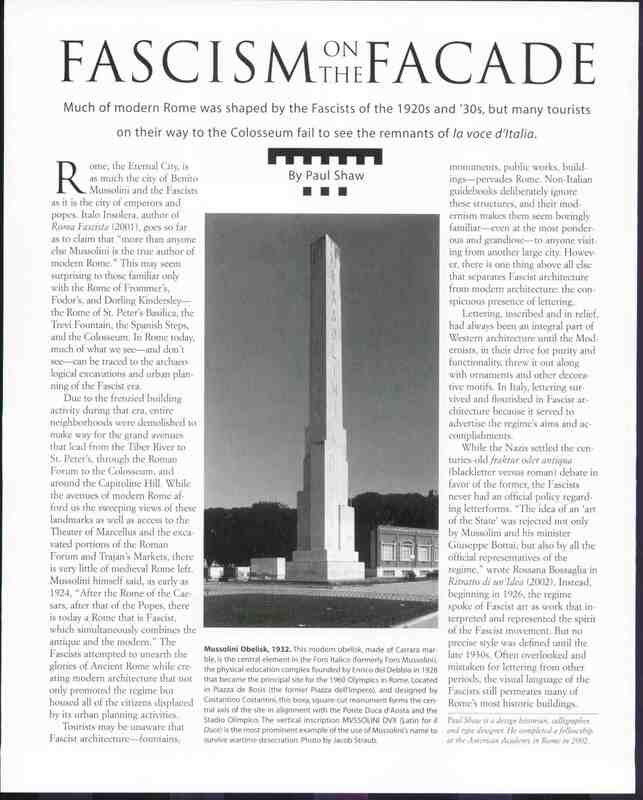 Once again, I have stumbled across an old article of mine online. 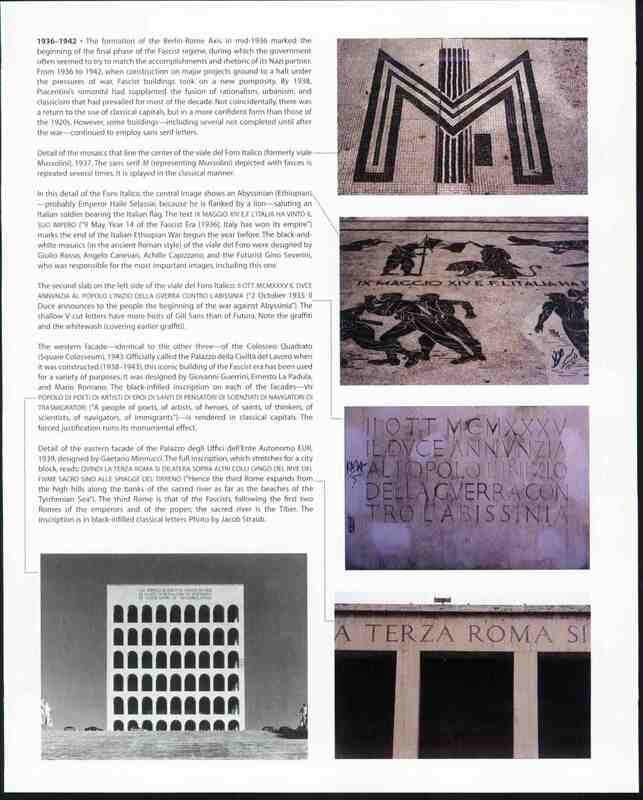 It is “Fascism on the Facade” in Print LVIII:III May/June 2004, the 2004 European Design Annual. It can be found on the website (under Lesson Plans) of graphic designer Brian R. Williams as part of his course “Defeating the Ideal: Art and Propaganda, from the Third Reich to the CIA” (HNLA101). 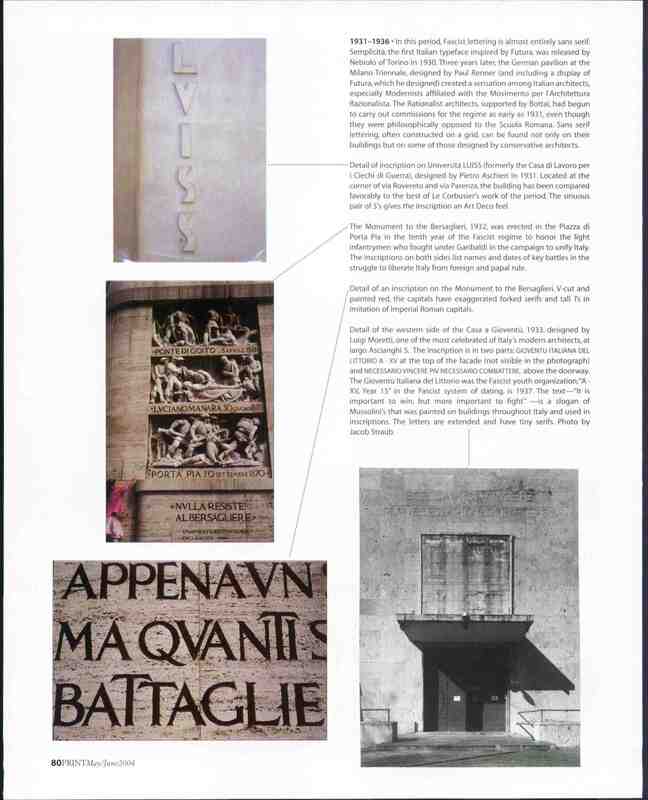 I am adding the PDF of the article here Fascism on the Facade-Shaw and also displaying the pages. The images are all analog. The black and white photographs are all by Jakob Straub (not Jacob Straub as the credit says). The color photographs are slides I took between 1995 and 2002. 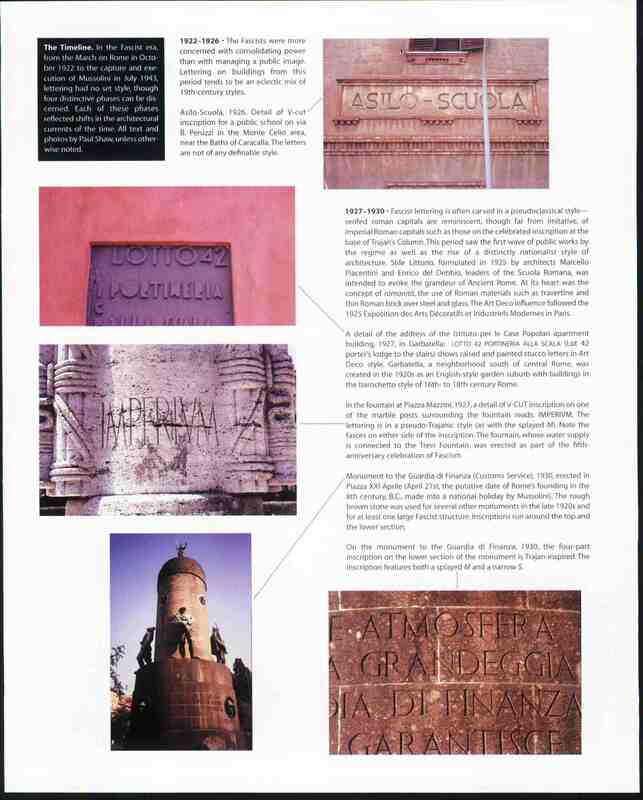 Below are some digital photographs I have taken of Fascist inscriptions since 2005. They show four different approaches to sans serif lettering in the 1930s: Art Deco, idiosyncratic, modular and geometric. 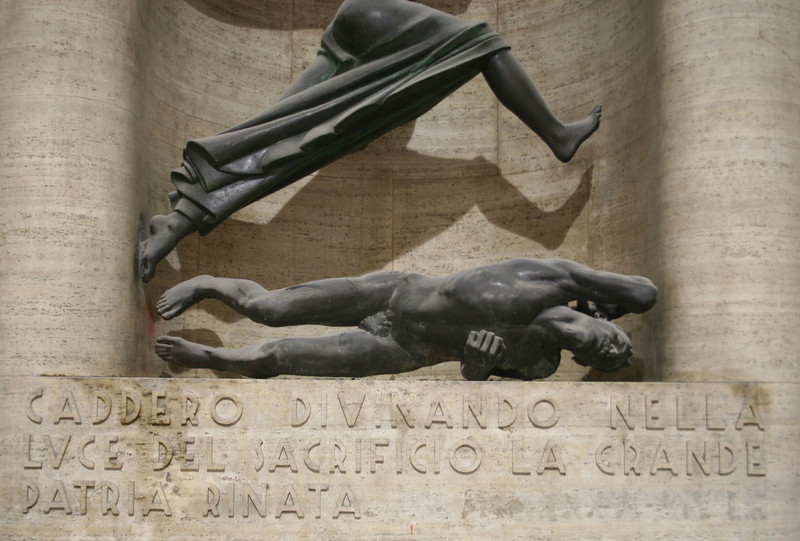 Detail from a Fascist monument in Arezzo to those who fought in World War I. 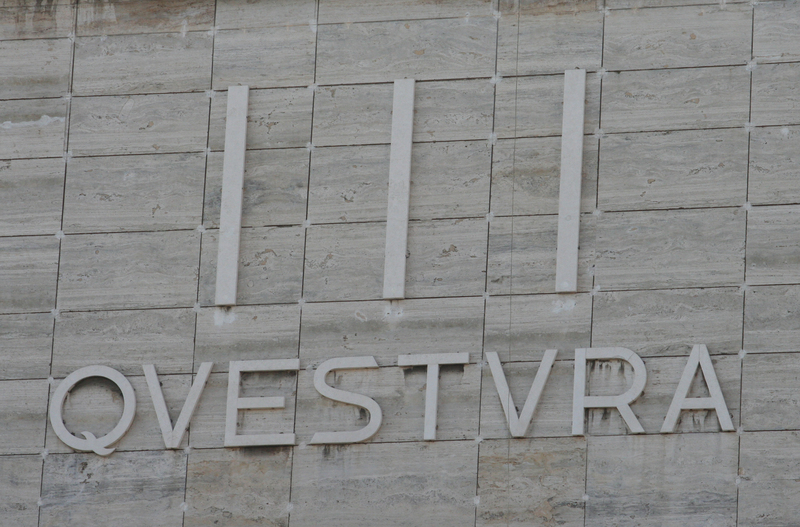 The sans serif capitals are Art Deco in style. Note the erased date MCMXXXVI–XIV E.F. at the bottom right (the 14th year of the Eta Fascista or Fascist era). Piscina Comunale Coperta Roberto Cozzi (Milano, Luigi Secchi, 1933–1935). The lettering is inspired by Futura which was used in the German Pavilion, designed by Paul Renner, for the V Triennale di Milano in 1933.